For those that have followed my tweets and blogs over the past little while may have noticed something a little different recently. 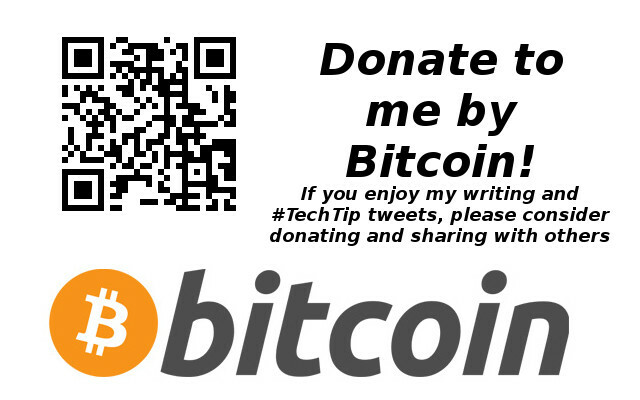 Many of my #TechTip tweets and blog posts are including a donation section in them. Why? I have always enjoyed educating people about technology and ways to stay connected. It gives me a unique opportunity to think about challenges small business owners face every day when they look for ways to help improve their business. I have gotten a lot of positive feed back on my daily #TechTips and I want to keep up promoting them. I have decided to ask people to do one of two things if they like my #TechTips or blog posts: Share them on Facebook, Twitter, Google+, LinkedIn, Reddit, whatever social media platform you like. If you think it is an interesting topic, Like it, Share it, post it, +1 it! Fairly Simple. Secondly, I will start accepting donations to help keep the site up and running. I’m going to accept them via Bitcoin. Some of you may not have heard of bitcoins. They are a new internet based currency/commodity that allows for near instant and secure payments over the Internet. Bitcoins are generated completely online by computers that work to run the system. You may be wondering why I am doing this instead of suggesting something like PayPal. This is part revenue generation, and part Internet experiment. Journalism has been facing a dilemma for a number of years. How do you pay journalists for their work in an online world where news is almost expected for free? Many news sites have turned to paywalls that require you to make a payment to read the article. This has not become favourable with many Internet users who are used to finding news online for free. Also with such a plethora of news articles and blogs that are free, it makes justifying those paywall payments difficult. Advertising is the other most common method of paying for journalists work. The natural problem comes when advertisers who contribute their dollars to a news source have the potential to influence the editorial board of a news site. History is full of instances of those with money influencing the news story to their favour. How do you balance revenue with journalistic independence? I recently discovered an interesting way to promote journalistic integrity online while bringing in revenue. I was doing some research for a recent blog post I wrote on bitcoins (Available here to read) and saw how bitcoins are being used to make micro payments to make donations to writers and bloggers for their work. The example went on to explain how easy it was to send a bitcoin donation simply by posting a picture of a QR code with your bitcoin address on it. Imagine supporting an independent journalist by sending them a small donation. With bitcoins, you can make small donations to the fraction of a penny, meaning a small donation of a few cents can be made. A single donation of a few cents may not sound like much, but on a larger scale, like the number of people who read an article, it can add up. I want to make a proof of concept experiment to prove it is possible to request, and generate revenue, using bitcoins for secure and annonomous donations for work done. Help me prove this concept. As stated above, if you like my work, share it on social media. If you have bitcoins, consider helping out by making a small donation. If you don’t have any bitcoins, but are interested, we’d be happy to help introduce you to the idea of bitcoins, and point you in the right direction of where to look to get involved. This entry was posted in Bitcoin Talk, Editorial, Opinion and Analysis and tagged Bitcoin Talk. Bookmark the permalink.